Hardcover: Alfred A. Knopf, 2008. David Price tells the story of a business that began with a dream, remained true to the ideals of its founders—antibureaucratic and artist driven—and ended up a multibillion-dollar success. A story of technical innovation revolutionizing animation, and based on interviews with dozens of insiders, THE PIXAR TOUCH examines the early wildcat years when computer animation was thought of as the lunatic fringe of the medium and follows its development to today, showing how writers, directors, and animators make their astonishing films. Pixar's technical genius and founding CEO, Ed Catmull, inspired by Disney's "Peter Pan" and "Pinocchio," dreamed of becoming an animator, realized he would never be good enough, and instead enrolled in the then new field of computer science at the University of Utah. Catmull founded the computer graphics lab at the New York Institute of Technology and wound up at Lucasfilm during the first Star Wars trilogy, running the computer graphics department. He found a patron in Steve Jobs, just ousted from Apple Computer, who bought Pixar for five million dollars. Catmull went on to win four Academy Awards for his technical feats and helped to create some of the key computer-generated imagery software that animators rely on today. 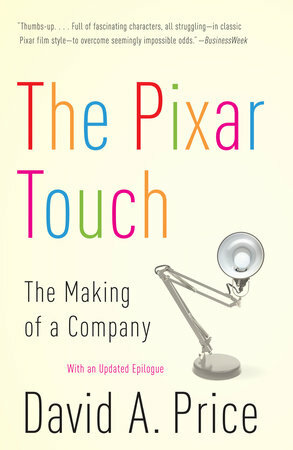 Price also writes about John Lasseter, who catapulted himself from unemployed animator to one of the most powerful figures in American filmmaking; animation was the only thing he ever wanted to do (he was inspired by Disney's "The Sword in the Stone"), and Price's book shows how Lasseter changed computer animation from a novelty into an art form. The book delves into Pixar's corporate feuds, between Lasseter and his former champion, Jeffrey Katzenberg ("A Bug's Life" vs. "Antz"), and between Jobs and Michael Eisner. It explores Pixar's complex relationship with the Walt Disney Company as it went from Disney satellite to multi-billion jewel in the Disney crown. Chosen by the Wall Street Journal as a "Best Book of 2008" and by Library Journal and Fast Company magazines as a "Best Business Book of 2008"